Sundance winds down this weekend, but the distributions deals are heating up as a trio of titles announce their acquisition: Skeleton Twins, Love Is Strange, and The One I Love. Coming Soon clued us in to the first of these three deals. Skeleton Twins stars Kristen Wiig and Bill Hader as the titular twins. But veering away from expectations, this feature from director Craig Johnson is not a flat-out comedy. Instead these two funny folk set aside the slapstick and silliness they are known for and dig into drama with the story of estranged siblings who reunite in a moment of simultaneous crisis. Like Will Forte before them, these former Saturday Night Live co-stars are gaining serious praise for their serious turn. But according to reviews out of Sundance, this drama isn't all darkness. Film Threat's review reads, "It is rare to see a film as tonally balanced as The Skeleton Twins. It is both a tearjerker and a crowdpleaser, often in the same scene." With all the Sundance buzz, Skeleton Twins has attracted Lionsgate, Roadside Attractions, and Sony Pictures Worldwide Acquisitions as distributors. Lionsgate and Roadside Attractions have inked a deal to release the film in the US, while Sony will open it overseas. Skeleton Twins could hit theaters Stateside as early as this summer. Another wing of Sony has scooped up a different drama garnering praise at the star-studded film festival. Sony Pictures Classic acquired Ira Sach's Love is Strange, a follow-up to his Spirit Award-nominated Keep The Lights On. 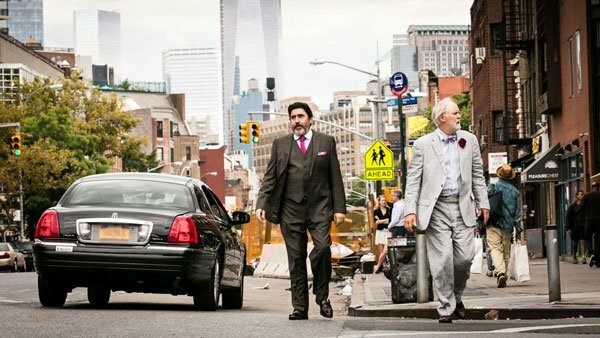 Like his last film, Love is Strange focuses on a troubled gay relationship in New York City. Alfred Molina and John Lithgow star as George and Ben, partners of 39 years who "make it official" once marriage equality comes to New York City. But a change in laws doesn't always equal a change in minds, and their wedding sparks homophobia that gets George fired from his longtime job at a Catholic school, forcing the couple to move out of their Manhattan home and seek separate living situations elsewhere. While George is able to crash with a couple of gay cops next door, Ben moves to Brooklyn to stay with his nephew. The strain of their separation impacts all around them. Or, per Time Out New York's review, "It's an essential--and essentially New York--story about limited room, limited time but incalculable attachment." Love is Strange makes for SPC's third Sundance pick-up this year, following Whiplash and Land Ho! There's no word yet on when Love Is Strange might hit theaters. While Deadline reported a deal was in the works, cast member Cheyenne Jackson updated us all with this Instagram message: "YEAH BABY!!! Per Deadline.com. @loveisstrangemovie gets picked up by Sony Pictures Classics. Congratulations @irasachs & the whole family." Lastly, Deadline divulged that The Weinstein Company is throwing its weight behind The One I Love. Its Radius-TWC branch made a $2 million deal within 24 hours of the film's Sundance debut. We first heard of this production last March, when Charlie McDowell's directorial debut scored a cast that included Elisabeth Moss, Mark Duplass and Ted Danson. The One I Love is a dramedy that centers on an unhappily married couple (Moss and Duplass) who are advised by their marriage counselor (Danson) to take a weekend getaway to reassess their relationship and reconnect with each other. Something strange happens over this weekend, but what that is has purposely been kept out of its synopsis. As Variety's review explains, "(The One I Love is) a pleasure to watch but a challenge to discuss without spoiling a good deal of the fun." Radius-TWC hasn't yet teased when The One I Love will be released.